This mushroom cheese soup is perfect as a starter or the main meal. It’s quick and has only 6 ingredients which makes this easy mushroom soup recipe the perfect go-to when you want something simple, but loaded with flavor. Nothing is more satisfying and comforting on a cold, blustery day than a bowl of creamy homemade soup. While this simple mushroom soup recipe is delightful any time of year, it’s absolutely perfect when the cold snaps and the snow starts to fall. It’s rich and creamy, but is made without any cream at all! 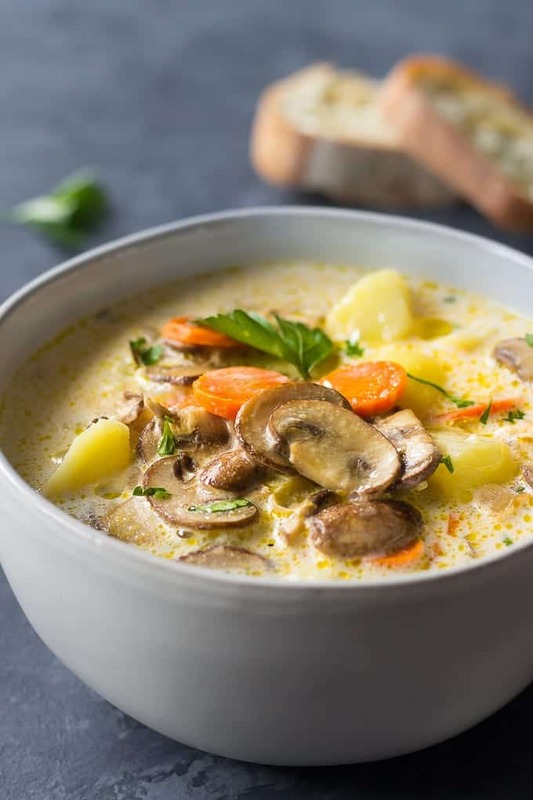 The flavor in this simple soup comes from the choice of mushrooms, some spices, and the secret ingredient that gives it the creamy, cheesy goodness you’re going to love. 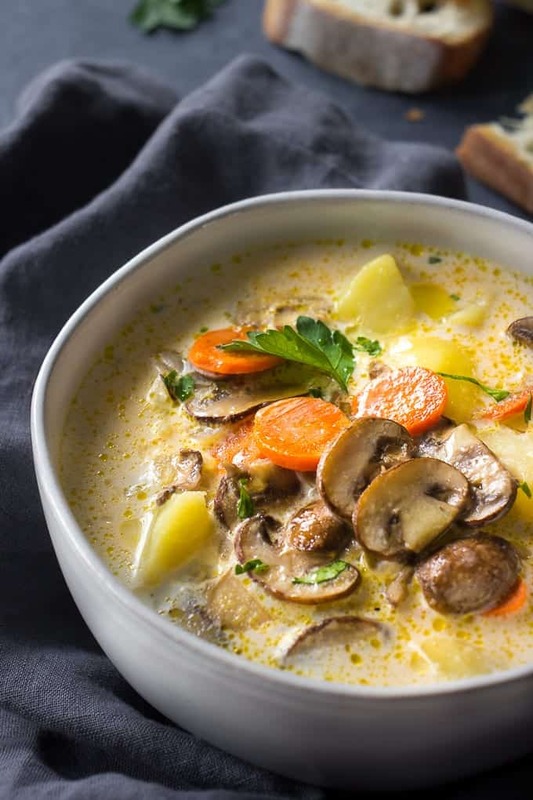 Delicious recipes don’t need to be complex; simple yet well chosen ingredients come together for a delightfully rich and creamy homemade mushroom cheese soup here that isn’t at all hard to make. From the choice of mushroom to the creamy cheese and simple spices, everything you’re adding is easy and yet results in a flavor that’s over the top delicious. 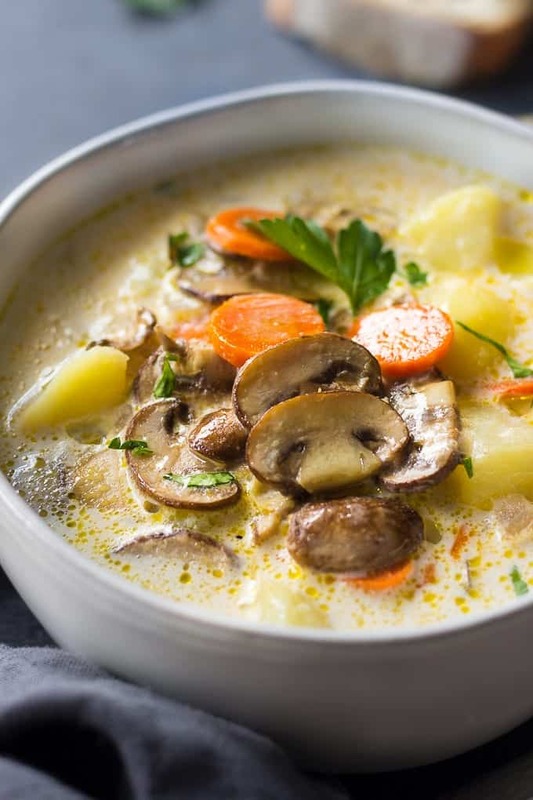 Which Mushrooms Are Best For This Simple Mushroom Soup? In this recipe, you’ll see Portobello mushrooms called for. They are firmer than other mushroom choices and have a richer flavor because of their age. These rich, simple mushrooms are often a favorite in cooking because they are large and meaty. However, if you wanted, you could also include Shiitake and/or Porcini mushrooms to add more depth to the flavor; it’s all up to you and what you have readily available. Shiitake mushrooms are almost impossible to overcook and have a very distinct, smoky flavor that would make a nice addition if you want to expand a bit and use a few different varieties. Porcini mushrooms are the ones you’ve likely seen in Italian dishes; a few of them go a long way toward adding a woodsy taste that holds its own amongst other seasoning. You’re probably wondering how to get the creamy goodness of mushroom cheese soup without cream. Are you ready for the surprise? This recipe uses spreadable cheese! It’s so easy and yet gives you the flavor of a much more challenging recipe. You’re not going to believe how easily this homemade mushroom soup comes together! The first step is to melt some butter in a large pan. Not too high on the heat though; medium is perfect. Add in your onions and carrots and sprinkle with salt and pepper. They’ll need to sauté for 5-7 minutes until the onion is translucent the carrot tender. Then it’s time to add in your mushrooms. Keep cooking until all liquid evaporates and the mushrooms have browned just a bit. This should take about 10 minutes. While you’re doing this, you can be boiling your potatoes until they are fork tender. Once that’s happened, add your cooked vegetables and stir in the spreadable cheese until it’s thoroughly melted in. Add some more salt and pepper as needed, sprinkle with some parsley, and enjoy! 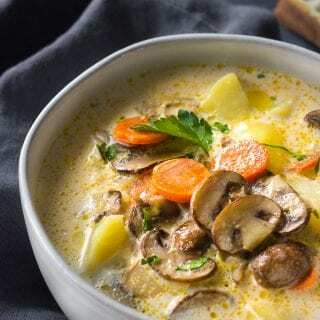 You're gonna love this delicious and creamy mushroom soup! It is perfect as a starter or the main meal. Plus, it's quick, easy, and has only 6 ingredients which makes it the perfect go-to when you want something simple, but loaded with flavor. Melt butter in a large pan and over medium heat. Add onion and carrot, season with the salt and pepper and cook stirring occasionally for 5-7 minutes or until onion is translucent. Add mushrooms and continue cooking until all liquid evaporates and mushrooms are slightly brown, about 10 minutes. Meanwhile add water and potatoes to a large pot and cook on a medium-low heat until potatoes are tender. Add cooked mushrooms and spreadable cheese and stir until cheese melts breaking big chunks with a wooden spoon. Adjust salt and pepper, sprinkle with parsley and serve. In order for cheese to melt faster, prior to adding it to a soup, I love mixing the cheese separately in a large bowl with half a ladle of hot soup. That way, cheese will be completely dissolved and all you'll have to do is pour it into a soup. This soup looks delicious and tasty. Cream cheese work as spreadable? Ashley, I’m not sure about cream cheese. For this recipe I’ve always used spreadable cheese The Laughing Cow. So I don’t know if the taste would be the same with cream cheese. I am looking forward to making this Mushroom Soup. What spreadable cheese did you use in this recipe? Awesome! I used The Laughing Cow spreadable wedges.